i b i k e l o n d o n: We're ready to "Get Britain Cycling", is the Government? We're ready to "Get Britain Cycling", is the Government? The Get Britain Cycling Inquiry final report will be published on Wednesday, containing a raft of recommendations to Parliament on how to bring about more and safer cycling in the UK. The inquiry heard from motoring bodies, Government ministers, cycling organisations and safety campaigners, as well as bike bloggers (including me), traffic planners, urban designers and the police at Parliament earlier this year. The report, being compiled by Professor Phil "peak car" Goodwin, is likely to recommend that drivers who kill or maim cyclists should face longer jail sentences, greater investments in routes for cyclists is needed, as well as a review of some cycling design standards. The report comes on the back of The Times newspaper's ongoing Cities Fit For Cycling Campaign and a five year high in cycle deaths in 2012, with 122 people killed on bicycles on Britain's roads. “What few people realise is that this process has been undertaken before, when an almost identical inquiry led to a report and recommendations. “That report, more or less, came to nought... I’m anxious that this time around the pressure stays on to implement the outcomes. “The enemy will not be a visible stance against actions that promote bikes. It’ll be apathy and lack of positive actions and political courage." 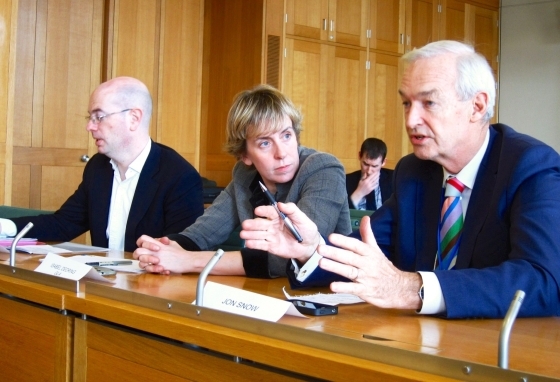 Jon Snow giving evidence at the Get Britain Cycling Inquiry, alongside Deputy Mayor of London for Transport Isabel Dedring and the Mayor's Cycling Commissioner Andrew Gilligan. "The politician that takes leadership on cycling and really revolutionises it will leave a legacy for generations". Snow opined that Britain needs political “leadership from the very top and on a big scale", if it is to catch up to other Western European countries with developed cycling infrastructure. Indeed, many wise words have been said throughout the inquiry, and messages from all quarters - be that from the sports body British Cycling or vanguard campaigners the CTC - have been surprisingly harmonious and consistent; namely, the need to learn from the most successful cycling countries, to build cycling infrastructure but to build it very well, to spend more money on growing cycling, and to focus on road law and sentencing reform to protect the most vulnerable road users. "They're both cycle enthusiasts but they're also realistic. "If we reached Dutch levels I'd be ecstatic, but I can't see us getting there. I went to to Leiden railway station and there were, I think, 13,000 bikes there that morning, which is just a different world from all other European countries. The Dutch have been fantastically successful. It is by and large flatter in Holland than it is in the UK, which is certainly an advantage, and it's more compact, so there are differences." Minister Baker failed to touch on whether he thought there were direct lessons to learn from the "fantastically successful" Dutch. 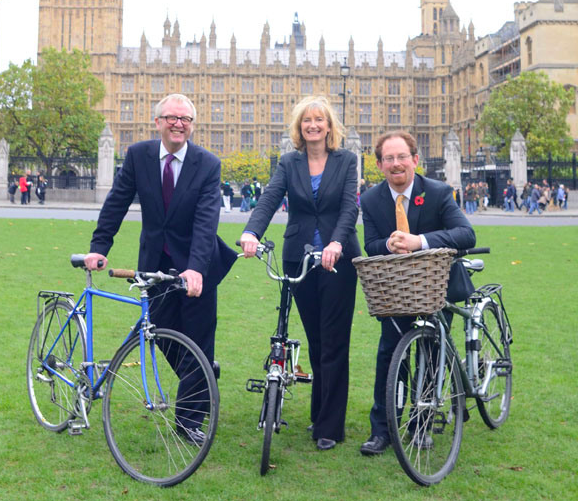 MPs Ian Austin, Sarah Wollaston and Julian Huppert of the All Party Parliamentary Cycling Group, who've led the cycling inquiry. "The key place to start is for everyone reading this article to take two minutes to ask themselves, ‘What does the place I want to live in look like?’ ‘What kind of place do I want my kids to live in?’ I doubt anyone’s vision involves more cars or more parking. Clearly, this report is just the beginning of a long process of getting our Government to start really taking cycling seriously - we're going to have to all keep up the pressure if we want to see real change on our streets and truly #getbritaincycling.